While two full years of interim scouting will allow us to fill in all the details, here are some highlights of the special itinerary being developed for Santana’s 50th chartered-ship cycling cruise. Next June we’ll provide detailed flight guidance that will allow our participants to snag those free award flights the day they’re released. We’ll fly into Sapporo International Airport. To make life easier for our guests, Jan and I have learned to put together a value-packed package of guided-activities that tempts most participants into arriving 2 or 3 days before embark, which occurs at the convenient port of Otaru. To showcase Hokkaido our circumnavigation uses a carefully-crafted collection of coastal rides to pass through farms, forests and fields of flowers. You’ll marvel at UNESCO heritage landscapes, distant volcanoes, dense stands of fragrant bamboo, and a steaming hot waterfall. We’ll pause at temples, castles, shrines, a samurai village, and the workshop of an esteemed sword smith. 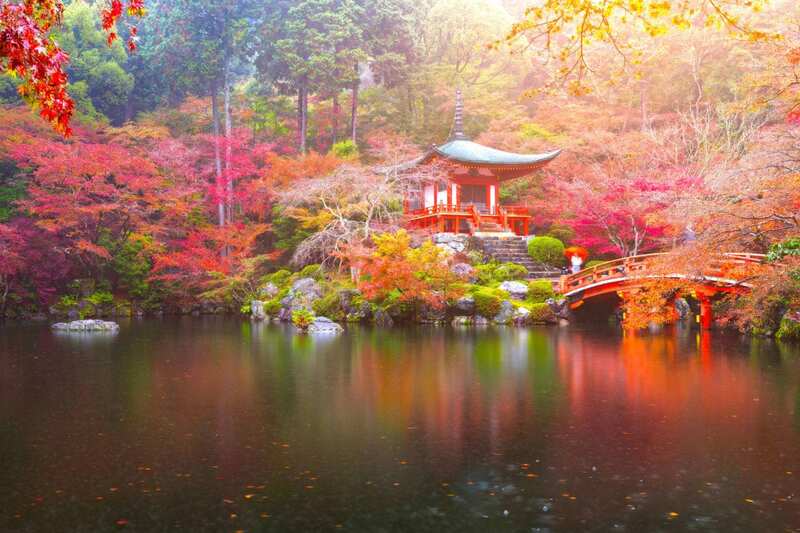 Particularly peaceful interludes from cycling includes a traditional Japanese tea ceremony, and a landmark botanical garden with a soothing spa for its monkeys. Ready for a brew break? Hokkaido’s master brewers have developed a global reputation for great sakes, soy sauce and beer—afternoon stops at historic breweries will acquaint us with all three. The final two days trace the western edge of Honshu, Japan’s largest island, to our disembark in Niigata. From there this tour includes a transfer to central Tokyo OR Tokyo’s Narita Airport. The M.S. Caledonian Sky is an all-suites expedition-rated cruiser. In addition to 7-seas worthiness and advanced stabilization, an expedition ship is designed to put teams of explorers ashore in places like the Galapagos or the Antarctic. To get scientists and their delicate equipment ashore an expedition ship uses landers instead of tenders. The Caledonian Sky has six large landers to allow dry-foot landings at a boat ramp or protected cove. A normal cruise ship requires ports the same way airliners need airports. Caledonian Sky, however, provides helicopter-like flexibility. With this unique ship we have a newfound freedom to design rides that aren’t dictated by the location of airports, harbors or hotels. Unlike the research vessels used by biologists, the all-suites Caledonian Sky is a luxurious expedition ship that provides fine dining, relaxing amenities and restful sleep. Moreover, this capable ship solves the common failure of bike tours, where a week or two of van-supported cycling won’t allow you to experience enough diversity. The Caledonian Sky allows an optimal cycling vacation by transporting cyclists up to 180 miles while they sleep. Imagine a cycling tour that explores 10 regions in 10 days—without a transfer or change of hotels. The dining room is large enough to seat everyone at once. Our five-star chef will create a regionally inspired menu for each meal with multiple choices for each course. The sommelier will provide wine pairings. Beer and wine are included at dinner. The ship serves three meals a day, and on certain days a mid-ride lunch is provided. When all day rides move in different directions, most cyclists will snack at local bakeries and cafes before returning to a welcoming buffet that will tide you over until dinner. Another place with seating for all is the ship’s Main Lounge where we bring aboard local entertainers and naturalists. The smaller Panorama Lounge is a great place to read a book, catch up on email, or enjoy a cocktail at sunset. It’s okay to feel sorry for your friends back home while dining on the Lido Deck. If you want to take lounging to a new level the beautiful Sun Deck is a great place to work on your summer tan. A: Poring over charts showing climate and rainfall, we chose mid-June for long days of sunshine and daily high temperatures in the 70s. Spring rains will have disappeared and peak humidity won’t arrive until the following month. We’re proud to have arranged the perfect dates: June 15 to 24, 2020. A: The MS Caledonian Sky was built to stabilize itself during expedition cruises to the extremely rough waters of Antarctica, the waters of Japan won’t even challenge the stabilizers. Compared to other vessels of it’s size, this ship is like riding in a Cadillac. A: Due to Santana’s friendship with Noble Caledonia, our per-person first-in pricing for this 10-day event in Japan starts at $5899. Premium stateroom categories cost more. Lowest pricing in every category is limited to the first few rooms. Booking early is easy and RISK FREE. Our reservations page shows pricing of available staterooms. A: Anyone who has visited Japan will tell you about expensive meals and accommodations that aren’t tailored to Western tastes. Our luxurious solution is an all-suites ship with an array of 5-star cuisine that includes local specialties. To celebrate our 50th cruise, and to thank our participants for the support that caused us to reach this incredible milestone, we’ll launch this first event of 2020 at a very special price! How low? Even though our costs are considerably higher for Japan, it’s priced the same as our equal length 2019 New Zealand cycling cruise that uses the same ship—a repeat cruise which sold out in less than 24 hours. With standard suites for our 10-day cruise of Japan starting at only $5899 per-person, this premier event could sell out even faster. A: Santana’s cruise hosts don’t accept tips. Santana’s comprehensive “cruise extras” fee of $300 per person includes cycling-specific extras, support teams, admissions, guides, and Sergio’s Coach (our non-rider coach bus). Shipboard gratuities, collected at the event, are $180 per person, and go to the ship’s crew. Port Fees are $400 per person. A: Certainly. The MS Caledonian Sky features deluxe bedding and spacious floor plans. The rooms have a private bath with shower, air-conditioning with adjustable thermostat, and are soundproofed. All Caledonian Sky staterooms are located on the exterior, and offer South Sea views or balconies. A: We will be the first group of cyclists to experience a Japan Cycling Cruise. The entire ship is ours, which allows a cycling specific itinerary that makes use of the Caledonian Sky‘s expeditionary capabilities. A: Detailed info by July ’19. Those who arrive and leave on the embark and debark days will receive FREE Airport transfers. A: Yes. If you own a nice bike that fits, however, bringing it with you is relatively easy and inexpensive. More info on this in Bill’s Travel Tips. Single bike rentals will be arranged, includes delivery to Sapporo and retrieval from Tokyo, we will notify all participants about 60 days prior to the event. A: In addition to our daily pair of zero-mile options (remaining on the ship or exploring the islands via our panoramic-window coach), every day has multiple cycling routes. Anyone who can ride a gentle 35 miles will be able to enjoy cycling every day. If you prefer hills or want to spend additional hours in the saddle, we’ve got you covered. At each morning’s breakfast you’ll get a map charting the day’s cycling routes and recommended stops. During a brief route talk you’ll hear about each route’s grades and difficulty. Santana’s vets have learned to love and rely on their handlebar-mounted gps units. Available for less than $200, these touch-screen marvels prevent the age-old problem of getting lost or riding unplanned miles. Santana supplies free electronic mapping and route files. Simply select the route and follow the highlighted map. Q: Does the Caledonian Sky have WiFi? Does the ship have an elevator? Our comprehensive “cruise extras” fee of $300 per person covers a long list of off-ship activities, admissions, guides, rider support, SOS-Vans, and our non-cyclist panoramic-window coach. Port fees are $400 per person. Because cruise ship charters are binding, non-cancelable contracts, Jan and I will only enter into this charter based on your confirmed-with-a-deposit commitment. In effect, we undertake a huge risk by guaranteeing full payment on your behalf. After entering into this obligation, we cannot afford for you to back out, for any reason. This is the same policy that existed on all but 1 of Santana’s 49 previous cruises. While preparing for our 2009 Danube event, I neglected to include the following provision (shown below). That’s the year a group of friends, after verbally agreeing to pay in full and then stringing Jan along for many months, decided to cancel their plans. Lesson learned!